Preparations are underway for the Great Wisconsin Birdathon 2019. Now in its eighth year, the Birdathon is the primary fundraiser for the Natural Resources Foundation of Wisconsin’s Bird Protection Fund, which has raised more than $1 million for bird protection and research since 2008. Local bird conservation groups also use the Birdathon’s tools and profile to raise funds for their own work. In 2018, teams representing Wisconsin’s bird clubs, Bird Cities, land trusts, nature centers and others took home $9,000 — half the funds they raised. 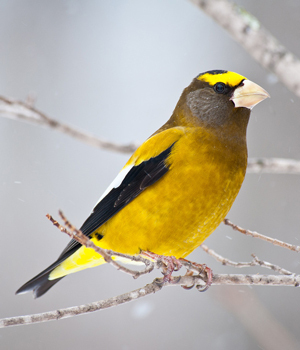 The Birdathon, organized by NRF and the Wisconsin Bird Conservation Initiative, takes place from April 15 to June 15, but now is a good time to begin forming a team. A birdathon event can be as short as a morning or as long as 24 hours. It can be a drive to birding spots around the state, or a “Big Sit” in your backyard. We especially encourage green birding by foot, bike and boat, and local patch Birdathons. If you wait until June, you can even combine your Birdathon with a Breeding Bird Atlas survey. Teams and birders that participated in 2018 will find it even easier to participate again: You won’t have to re-create your team or individual pages! We’ve saved a copy of last year’s website and can retrieve your archived text so all you have to do is modify it for the current year. Instructions will be emailed to last year’s participants once fine-tuning is complete. For new participants, the website is ready for your registration. Visit the site at WIBirdathon.org and check out the “Get Started” page for instructions. This year we welcome two new members to the Birdathon planning team: Tom Pearce, a Millennial Falcons team member, and Brenna Marsicek from the Madison Audubon Society. They join Sumner Matteson and Ryan Brady from Wisconsin DNR, Karen Etter Hale from the Wisconsin Audubon Council, Jim Shurts of team Reckless Wrens, and Cait Williamson and Diane Packett from NRF. The team serves as a bridge between the Birdathon and the birding community, helping to publicize the event and recruit teams as well as providing input and feedback. Plans for this year include a photo contest and a Birds and Beers kickoff. All participants are invited to submit photos from their Birdathon day, to help us share the excitement, fun and rewards of coming together with friends to help birds. Photos can be of birds, birders, landscapes and other special sights from the day. A fancy camera is not necessary; some of our favorite Birdathon photos were taken with a smartphone. Visit the “Photo Contest” page on the website for details. The Birds & Beers gathering – with door prizes-- for all those interested in the Birdathon will be held from 5:30 to 9 p.m. on Thursday April 25 at the Great Dane Eastside, 876 Jupiter Dr., Madison. If successful, we may organize similar events in additional areas next year. Come chat with Birdathoners, meet Signature Team members, exchange birding and fundraising strategies, and get help setting up your personal Birdathon page. Birders considering joining the event for the first time are especially welcome. Look for details on social media and in April’s Badger Birder. Photo contest prizes and door prizes for the Birds & Beers include a Screech Owl next box donated by Greg Hottman, a table-top bird fountain, a decorative flag, 5 pounds of wild bird seed, a deluxe suet feeder donated by Wild Birds Unlimited, a bird house donated by Ben Goss Bird Club, and an NRF field trip leader T-shirt.